Known to society as a rascal and reckless privateer, Captain Andrew James Rokesby actually transports essential goods and documents for the British government. Setting sail on a time-sensitive voyage to Portugal, he’s stunned to find a woman waiting for him in his cabin. Surely, his imagination is getting the better of him. But no, she is very real and his duty to the Crown means he's stuck with her. 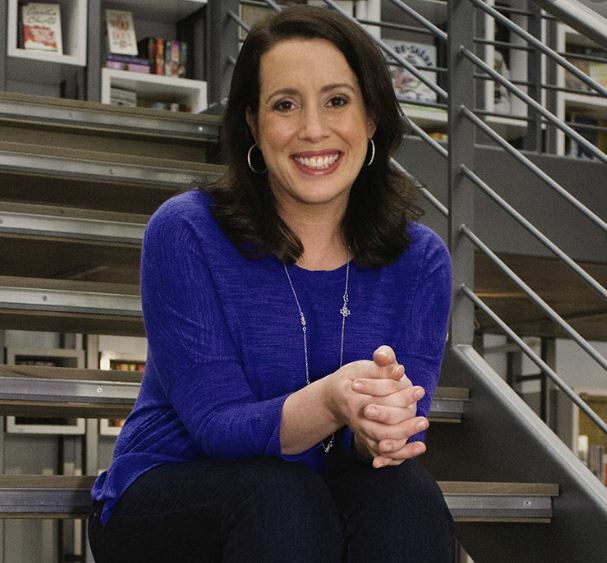 During her senior year at Harvard College, Julia Quinn (often known in cyberspace as JQ) realized that she didn't know what she wanted to do with her life. This depressed her. In fact, the only thing that saved her sanity during this dark, dreary time was the fact that none of her friends knew, either. So she sat down with a big tub of Ben & Jerry's and a good book and decided to figure out what to do. Getting a job seemed too difficult. She wouldn't mind HAVING a job, but she certainly didn't know how to get one. Law school seemed too annoying. Everyone hated lawyers, and Julia liked to be liked. Business school was not an option. They only took people who had been in the work force for at least two years, and, as noted above, Julia didn't know how to get a job. The only option left (this shows you how narrow her world-view was) was medical school. "Aha!" she thought. "I could be a good doctor." She quickly picked up the phone and ran this idea past her parents, who were understandably baffled, since her degree was in Art History, but being the cool people they are, they said, "Great!" Julia hung up the phone, blinked a couple of times, and said aloud, "Okay, so I'm going to be a doctor. Cool." Then she pulled out a pad of paper and proceeded to figure out how long this would take. (Note: careers in medicine are not for those who crave instant gratification.) It turned out that it would be over two years before she could even ENTER medical school since she had to take all those pesky science classes in order to apply. Clearly, she needed to find something to do during that time, since she knew from experience that she probably wouldn't be studying as much as she ought. That's when she looked at the book next to the tub of now-empty Ben & Jerry's. It was a romance. "I could write one of those," she thought. Two years later, just as Julia was deciding between Yale School of Medicine and Columbia College of Physicians & Surgeons, her agent called to tell her that her first two books, Splendid and Dancing at Midnight, were the subject of a fierce bidding war between two publishing houses. So she put off medical school for a year and wrote Minx. Then she put off medical school for another year and wrote Everything And The Moon. Then she got a little nervous and thought that maybe she ought to give med school a try and so she picked up a scalpel, started dissecting cadavers, and learned more about the citric acid cycle than anyone (including most med students) wants to know. A few months later, however, she realized that she must have experienced a bout of temporary insanity and she withdrew from medical school and wrote Brighter Than The Sun. This was followed by To Catch An Heiress and the critically acclaimed How To Marry a Marquis. Julia's writing has quickly earned a reputation for warmth and humor, and her dialogue is considered among the best in the industry. She has been profiled in TIME Magazine (a rarity among romance writers) and has even competed on the game show The Weakest Link. Each year brings more accolades; in 2001 she was a double finalist in the Romance Writers of America (RWA)'s prestigious RITA Awards (for The Duke And I and The Viscount Who Loved Me), and later that year she made her debut on the NEW YORK TIMES bestseller list with An Offer From a Gentleman. 2002 saw the release of the much-anticipated Romancing Mister Bridgerton, which was voted one of the Top Ten books of the year by the membership of RWA and was a finalist for the RITA Awards in the category of long historical. To Sir Phillip, With Love received a rare starred review in Publishers Weekly, the trade magazine of the publishing industry, and was later named by that publication as one of the six best mass market original novels of the year. The popularity of the Bridgerton series continued to rise with 2004's When He Was Wicked, and 2005's It's in His Kiss, both of which debuted near the top of the New York Times list. In 2006, Julia Quinn released the eighth and final installment in the Bridgerton series: the much awaited On the Way to the Wedding. The following year, she won her first RITA Award for this novel. In 2008, she again won the RITA, this time for The Secret Diaries of Miss Miranda Cheever. A few months after that, she achieved every writer's dream, and hit #1 on the New York Times bestseller list for the second book in her groundbreaking "Two Dukes of Wyndham" series: Mr. Cavendish, I Presume. Julia Quinn won her third RITA award in 2010, for What Happens in London, and was inducted into Romance Writers of America's Hall of Fame. She lives with her family in the Pacific Northwest.